Even after all these years, there’s still that twinge of loss at imagining what could have been with that show, had the network aired the series in order, or given us a full season order. I’m not alone in wishing the network had let things be and aired the original pilot, instead of the quickly pieced together “Train Job” episode. That original pilot, when it finally aired after the series had been cancelled, it answered every single nagging question that had been bugging me about the characters during every episode I’d been watching since the series debuted. My rage at the time of losing such a promising show was such that I enacted a personal boycott of Fox TV. I stopped watching 24, which was only in the middle of Season 2, and I even stopped watching baseball games on Fox for at least 5 years (and you know how much I love baseball). Yes, we’ve had a feature film and a few graphic novels, but it doesn’t quite make up for the disappointment of not having the series stay on the air a little while longer. 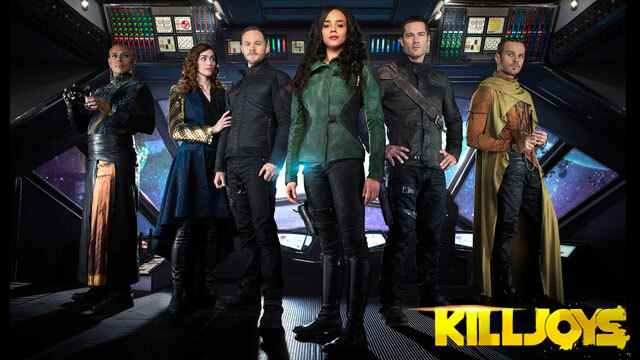 Fast forward to 2015, and Syfy Channel is in the middle of a science fiction renaissance, putting more and more good scifi originals and adaptations on air for us to enjoy, and Killjoys was one of the new ones for that television season. I was hooked before the first episode finished, and by the end of episode 4, “Vessel”, I’d begun to joke that in Killjoys I’d found my new Firefly… but it wasn’t until well after Season 1 had finished airing and I’d begun to really think about the show that I realized my running joke was more true than I had imagined at the time. For me, Killjoys is the new Firefly. Dutch is part Zoe, part River. Warrior, assassin, weapon. Practical, expedient, but still fiercely loyal, making her entirely dangerous and completely in charge. Johnny is part Wash, part Kaylee. Technical genius, piloting genius, and a consummate wiseass who manages to stay upbeat as well as unflinchingly protective and loyal. The care, concern and respect Johnny shows Lucy is very much in line with how both Wash and Kaylee regarded Serenity, as a home and a friend, not just a ship. D’avin is part Jayne, part Mal. He’s the loyal soldier, but he also walked away because he’d seen and done too much. He’s found the RAC, giving him a purpose, but what he truly believes in is his team, his family. He trusts that they will always get the job done together and that along the way they’ll have his back, and he’d die to cover theirs. This belief allows him a foundation from which to find his own ways to atone for the past. It’s just one part of his journey to find something new to fight for. Lucy is Serenity. Even though the team calls Westerley home, Old Town specifically, but they truly do live their lives on and around Lucy. The Company is the Blue Sun Corporation. Company scientists conducting secret (and illegal) experiments on members of the Army and on civilians on Westerley, and covering up incidents and accidents that could reflect poorly on the Company’s public image. The Nine are The Alliance. They run the Company, control the military, control the lives of the people on Westerley and Leith, even to the point of using force against the citizens of Westerley, who are the sole source of the worker class they need to churn through the work that the Company uses to create revenue for the owner class of the Nine Families on Qresh. There are some parallels with other characters, but not quite as strong, and I could be convinced otherwise by a good argument: Alvis could be Book, but his history comes from being a miner rather than a former soldier/Operative; Bellus could be akin to Badger, since she fields the warrants that the team takes on, but she also covers them when they skirt a little too close to the line, something Badger never would have done for the crew of the Serenity. It could also be theorized that the RAC is akin to the Browncoats, given that they are fighting a battle where they are outnumbered and technologically outgunned, but they’re up against an enemy that lives in their own house. Killjoys is my new Firefly, and as we follow the story, it becomes more than that. We now have a Season 2 to enjoy and a Season 3 to anticipate, something Firefly never had a chance to achieve. I just hope that any future home video releases have commentaries and extras, because the Season 1 Blu-ray is disappointingly sparse in that area… meaning they don’t exist at all. I too was drawn into this show the same way I was drawn into Firefly. 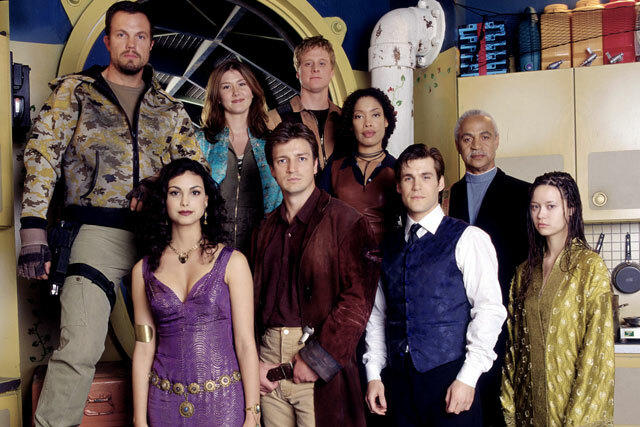 For me there are no real correlations other than the fact that the storyline is intelligent, no pandering here – the writers actually respect their audience’s intelligence, much like Firefly, and the characters are all important including the ship! What I love the most about it is that this is totally new ground with totally new characters, it is not rehashing old ground or stories, and the depth of personality in each character is stunning. 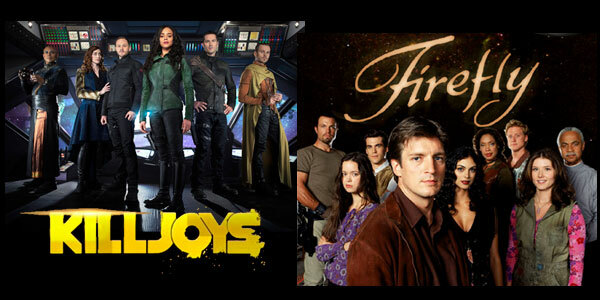 I loved Firefly, and everyone in it, and Killjoys has definitely taken over that empty space that was left when it was cancelled. But I disagree with the comparisons. In your review you compared Dutch to Zoey and River- I dont see it. 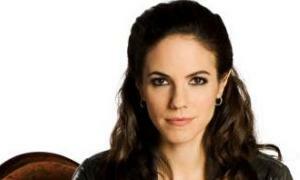 Zoey was always subordinate, to Mal, to Wash, even though she was strong and loyal.. that is nothing at all like Dutch. Dutch is strong and loyal, but she is never second in command to anyone.. a whole new person and one that has very seldom been portrayed before (it terrifies most menfolk to think that women aren’t really the soft vacuous beings they have always believed they are, who are there mostly for decoration, titillation and to validate the man in the frame). I haven’t watched much television at all since Firefly was cancelled, television has been a vast empty wasteland since then with a few flickering moments of shows that could have been great but were also never given a chance. Killjoys has changed that, and hopefully SYFY realizes what it has and gives it the opportunity to become a long running hit that it has the potential of being. (Sorry, I posted this on Facebook before I realized I could comment here) Still, love a good discussion at any time! I may have to clarify my intent a little bit when equating Zoe to Dutch. Zoe respected the chain of command, but was never afraid to voice her opinion whenever it wouldn’t undermine her captain’s authority. That reflects her honor, and her integrity as a soldier. Basically, there’s an innate strength in Zoe that everyone automatically trusts and that she’s not afraid to use when needed. Those qualities in Zoe are what I also see in Dutch, even down to her respecting the chain of command in the RAC… see her actions in the first episode, where she thought she’d be cut loose for skirting the rule in regards to the kill warrant taken out on D’avin. And since her husband was killed on their wedding day, we may never know if she would have grown into having a similar sort of relationship that Zoe and Wash did. Firefly is a masterclass in network interference. After what they did to Firefly, I was surprised Joss went back to FOX to do Dollhouse (Underrated and worth watching if you’ve never seen it. Make it to episode six and I think you’ll agree.) but I think that was only because Dushku had a deal at FOX. Of course he got shafted on Dollhouse too but it at least made it to season two and got a real ending. I doubt he’ll ever go back to FOX again. And lest you think the FOX network nitwits have learned anything since then, you only have to look to Almost Human to see that they didn’t. They aired most of the thirteen episode season out of sequence. They took a show with tremendous potential and killed it before it had a real chance. So… it’s nice to see Killjoys, Dark Matter and The Expanse thriving at Syfy. Whoever is calling the shots there is doing it right. And it’s so nice to have real SciFi Fridays back. Takes me back to the good old days of Lexx, Farscape and Stargate. I know that this is an older article but I just happened to read it and wanted to comment. First off, I like Killjoys but not as much as I thought I would when I first read about it and saw the trailers. I continue to watch it but something about it hadn’t worked 100% for me at first. Though I must admit that as the show has gone on it has grown on me a bit more. Regardless of that, in response to the premise of your article, I can’t argue with the parallels you draw between Killjoys and Firefly, however, for me personally I feel like Dark Matter is the show I would think about as more like of a Firefly replacement. It’s actually more centrally about a ship and crew, where Killjoys spends relatively little time aboard the ship. The Dark Matter crew are unknown to each other (do to the loss of their memories) at the beginning and grow to have some complex relationships and sense of family. You can also certainly draw some parallels between the characters from Firefly to Dark Matter as well. 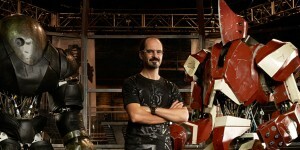 As the previous commenter said it is great that Syfy is bringing these shows for us to enjoy and analyze! Interesting observation, Robert… I connected more quickly to the crew of Killjoys than I did to the crew of Dark Matter, and Johnny’s attentiveness to Lucy SO reminded me of Kaylee with Serenity, I couldn’t help myself going down that rabbit hole. I haven’t watched S2 of Dark Matter yet, and I think I’d have to binge both seasons and keep an eye out for comparisons, but it sounds like it’d be a fun character study to do one day when I’m bored with nothing pressing to watch! Was perusing the site and came across this article only to find I had already read it and commented on it right after it was written two years ago. So now it’s 2018 and while Killjoys got the royal treatment from Syfy – of being able to actually finish their story without being canceled – Dark Matter and The Expanse were not afforded the same luxury. So really, same old Syfy as the one that unceremoniously dumped Farscape. Thank goodness for Amazon Prime that The Expanse gets to continue. Real shame about Dark Matter though. Too true, and unfortunately, all of our programming is dictated by economics. Despite the popularity and critical acclaim of The Expanse, Syfy wasn’t in a position to make as much money from it as they would if it were their own (or owned) production. I’m curious about how Deadly Class will play out on Syfy, but it’s not space opera, so doesn’t quite fall into the same unsteady TV space.